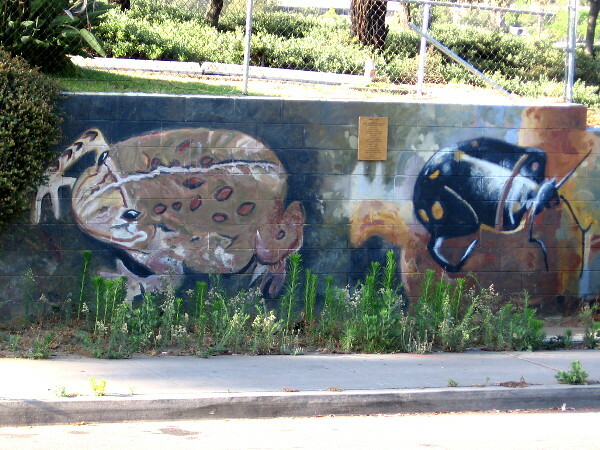 San Diego River wildlife in a Mission Valley mural. – Cool San Diego Sights! 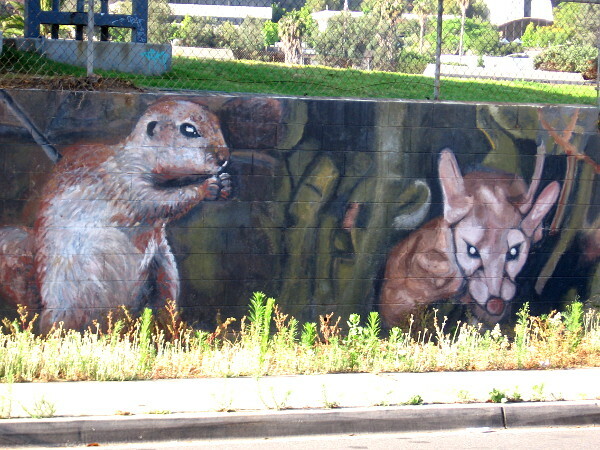 San Diego River wildlife in a Mission Valley mural. Faces peer from a wall near the San Diego River. 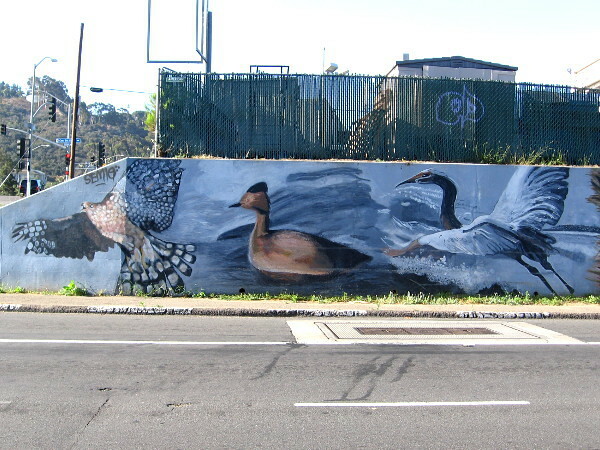 The very long mural, titled River Life, contains images of wildlife one might find here–or have found here before urban development. 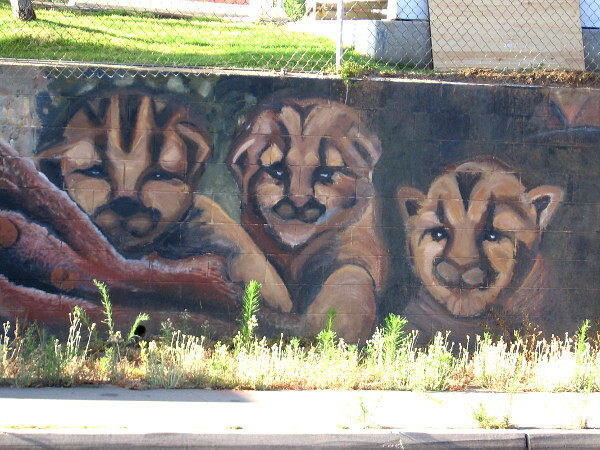 I love this mural in Mission Valley. 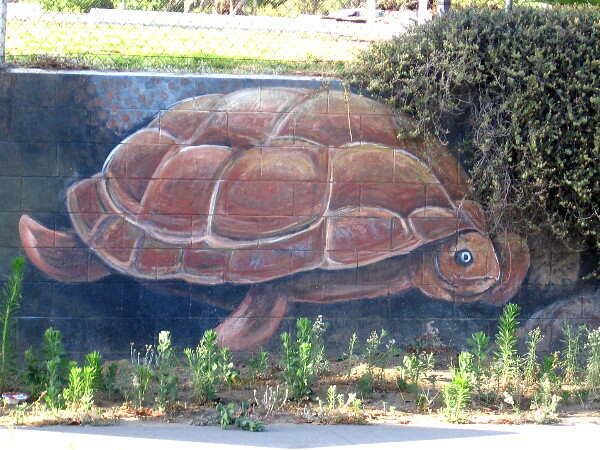 I remember driving through the intersection at Qualcomm Way and Camino de la Reina years ago, and seeing a whole bunch of people painting wild river animals along the ugly low wall. A little research today tells me that memory was from late 2009. 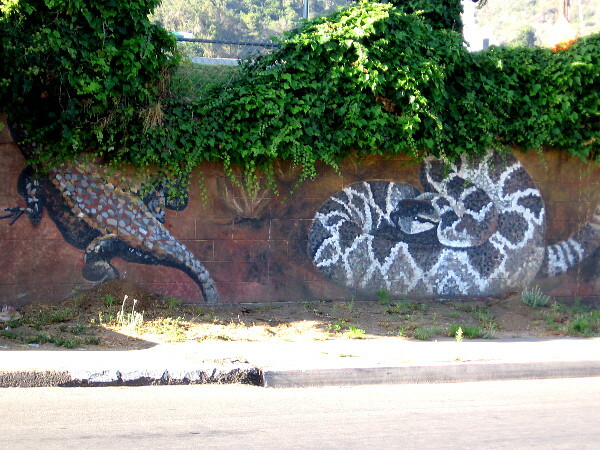 Creative kids paint San Diego River Estuary mural. San Diego River animals gather under city bridge. 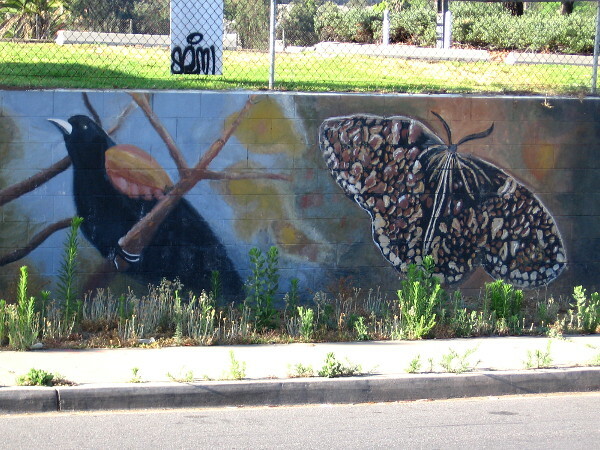 Ribbon of life mural by the San Diego River. Faded public art glows by neglected river trail. The left end of a long, colorful mural in Mission Valley. Birds of the air and water are featured here. The art was designed by Lori Escalera in 2009. A heron, hummingbird and frog. Down by the beautiful River Trail, just south of where we stand, many different birds can be spotted on the quiet surface of the San Diego River, and in thick reeds and overhanging tree branches. 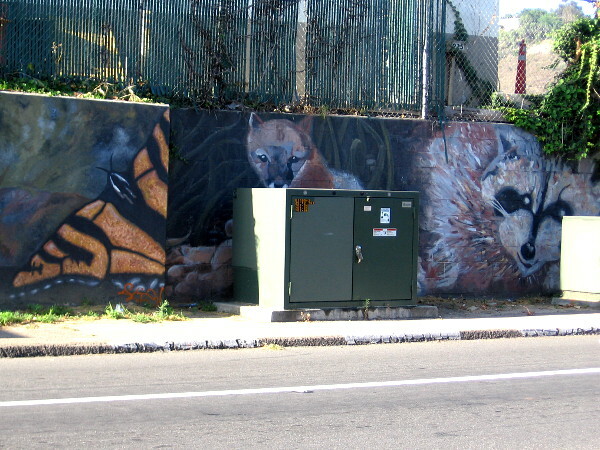 A butterfly, a fox (peeking from behind a transformer box on Camino de la Reina) and a raccoon. Some sort of lizard–perhaps a Gila monster–is half hidden by leaves, while a rattlesnake coils nearby! A jackrabbit and wild coyote. 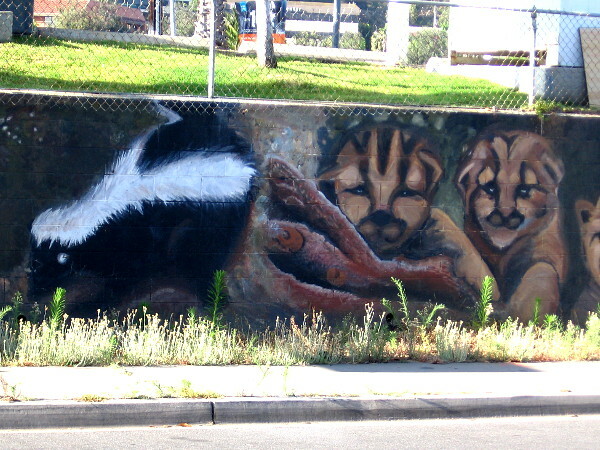 A skunk and perhaps kitten bobcats. I recognize a squirrel, but I’m not sure about the other animal whose eyes seem to be glowing in the dark. I believe that’s a Red-winged Blackbird and a moth. Looks to me like a toad and a beetle. If you can accurately identify these creatures, feel free to leave a quick comment! That looks to me like a turtle–or a tortoise! It’s obvious this blogger still has a whole lot to learn! Thank you Richard! Wow, 200 volunteers. Pretty fascinating. 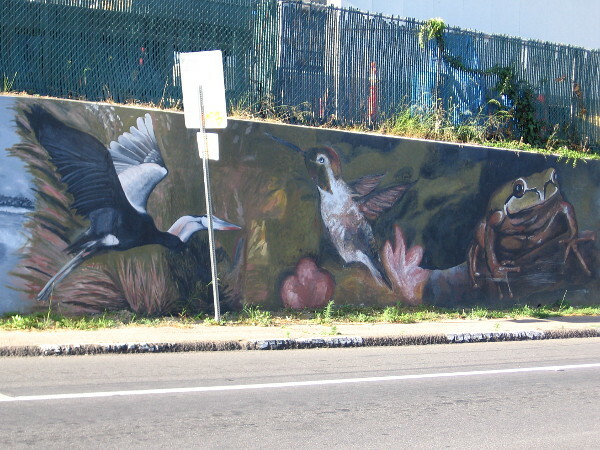 I love the mural with the hummingbird. 🙂 Blessings. 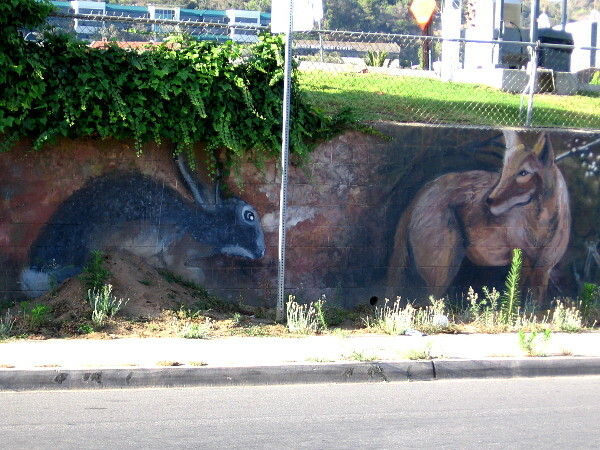 It’s one of my favorite murals around San Diego! Whether you have a lot to learn or not, you always give us a great view of your diverse city! Previous Previous post: Cold War history: How one man stopped World War III. Next Next post: Help homeless kids ascend to new heights!